Right Up My Street: Fashion: Boohoo - Whats Your Style Squad? Fashion: Boohoo - Whats Your Style Squad? I was recently contacted by the lovely content team at Boohoo asking if I'd like to collaborate on their new Style Squad campaign. I was challenged to take their "Whats your style squad?" quiz and then Boohoo would kindly kit me out in some fresh new threads for my wardrobe, I just had to make sure to incorporate at least one item from my assigned style squad into my chosen outfit. The quiz is aimed to determine which style squad you fit into: GLAM, URBAN, BOHO, SOPHISTICATED or GIRLY. After taking the quiz I can hardly say I was surprised that after answering the questions I was assigned to the - Boho Squad. To be honest, I kind of have my toes dipped into just about every single one of the style categories above. However, its true, there's nothing quite as summery as a romantic white lace dress and the boho squad sure knows it. According to Boohoo - Boho style squad members are all about freedom in fashion; floaty fabrics and flared detailing. I'm definitely still a late adopter of the "flared detailing" trend, purely because I don't think flared trousers suit my body shape, however floaty and oversized fabrics; jumpsuits, playsuits (only gathered at the waist), beach dresses and maxi dresses - anything with an air of graceful yet natural elegance is definitely my style. This wasn't a tricky challenge at all because I absolutely love bohemian clothing and the laid-back, floaty vibe each boho piece can convey. This outfit from head to toe is Boohoo and staying true to my style and squad I centered most of my outfit towards a "Boho" theme, in particular I picked up this khaki brown off-the-shoulder playsuit with tasseled sleeves. 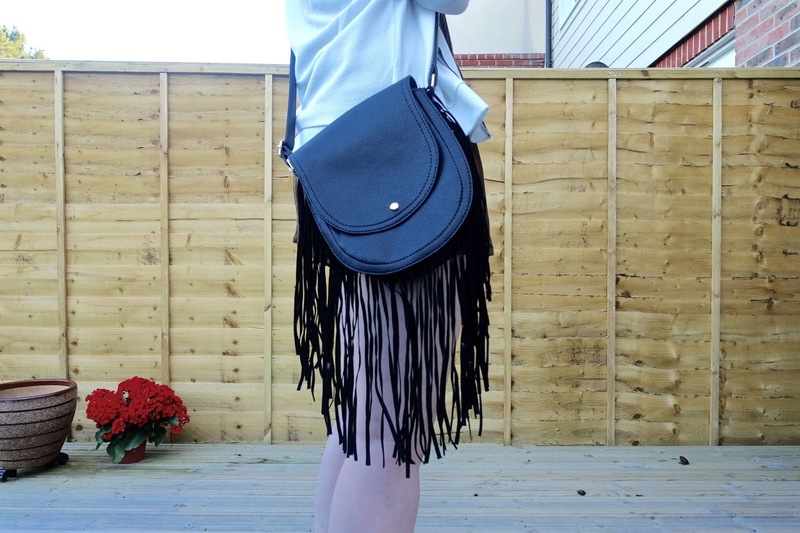 Heading towards the festival style route I opted for these gorgeous fringed mule wedges and the almost matching tasselled saddle cross body bag, both quite similar with their tassel detail - the perfect pairing! I decided to give this rather relaxed outfit a sharp edge with a crisp white bomber jacket - a bit more urban / glam in style. The great thing about Boohoo is that its accessible, on trend fashion for all, with such low prices, this entire outfit totalled just under £70 (see all items linked above) - not bad going huh? Interested in finding out which Style Squad you'd represent? Labels: bohemian fashion, boho style squad, boohoo, collaboration with boohoo, fashion, festival fashion, rightupmystreet fashion blogger, whats your style squad? I'm in the casual squad! Woo hoo!! 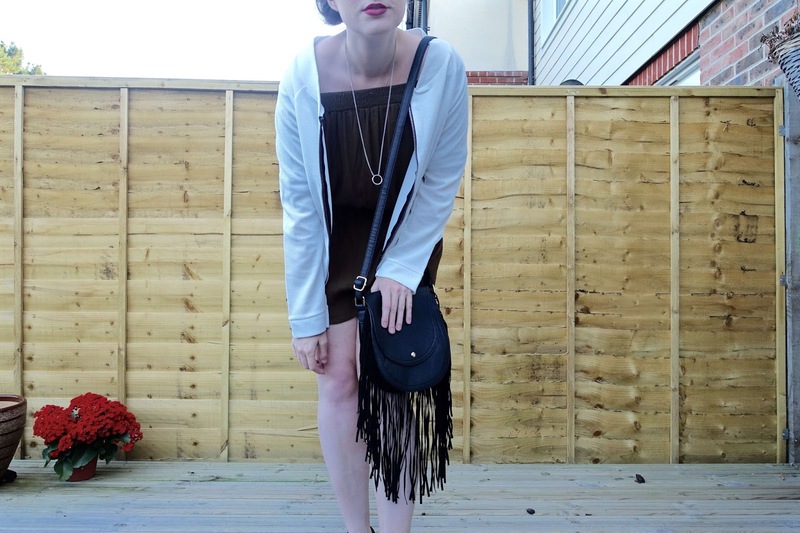 Love how you have styled the boho trend! The accessories really finish the look off perfectly! I love this look, the tassle boots are my absolute favourite... NEED!